This really should be better than it is. It was a three-day process to make these pies. 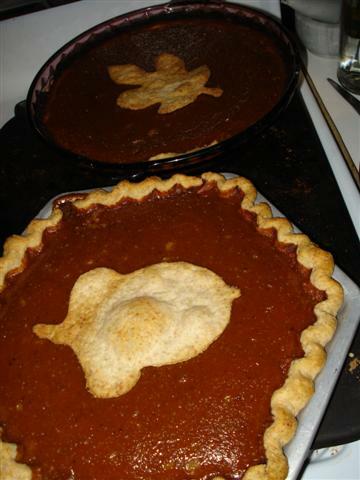 Monday, I baked two sugar pie pumpkins that I got at the farmer’s market. Tuesday, I scraped them out and pureed the flesh with a hand-blender. I also made the pie crust…by Sort Of following this Cooks Illustrated recipe for vodka pie crust (meaning I altered so much that it was absurd to think it would work). I’ve tasted this crust before; my sister-in-law Natalie made a peach pie last year that was the best I’ve ever had. I tried to make a 1.5 recipe (not a straight double), and my math may have been off. I substituted half of the flour with homeground whole wheat that I made that day using the kitchenaid attachment. I used coconut oil (solid at cool room temp). I failed to chill it. The dough was sticky wet and I ended up adding lots more white flour. Wet and pasty before I ever added the vodka. Wednesday, I added the vodka/water to the chilled crumbles. I rolled out a sample and baked it up with cinnamon sugar and it was yummy. Nice and crisp. So I formed my crusts (the dough didn’t hold together great and I had a few tears) and put them in the freezer. Then I stirred up the pie filling Kind Of following this “old-fashioned” recipe (we’re trying to cut out canned stuff, so I was avoiding evap. milk). I substituted the sugar for honey and molasses, mixed. I cut some of the milk to account for this extra moisture. I used too much molasses. I used eggs from our chickens, and milk from a local dairy. I baked them forever in order for that light custard to gel. This pie should be GREAT. It was more like a fluffy-light, OVERLY spiced gingerbread souffle in a crust. But Pretty. It IS pretty. and tasty enough when served with a whole pile of lightly sweetened whipped cream. Here you can see it’s homely stepsister in the background. Vodka pie crust? That sounds interesting. They are pretty and souffle in a crust, still sounds yummy to me. I know what you mean about the baking the pumpkin part, that happened to me when I decided to make pumpkin bread the morning of my Open Studios, first bake pumpkins. Takes all the spontaneity out of it. 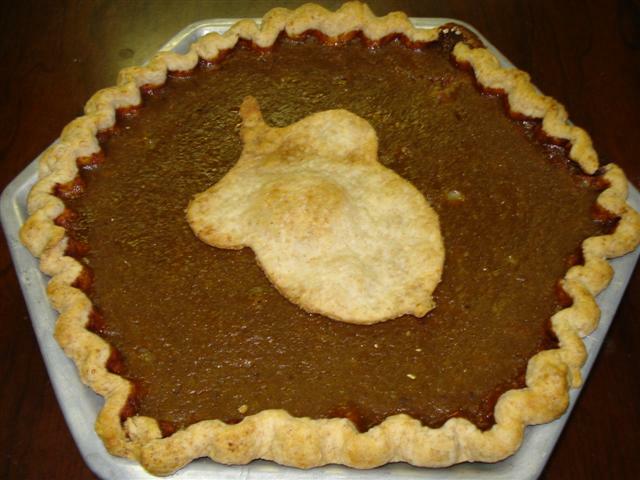 I love the Cook’s Illustrated pumpkin pie I made. In fact, I should go make another right now, as I have cooked pumpkin goo in my fridge. Anyway, they have you blind-bake the crust, then made a pumpkin custard thing on the stove, then put the custard in the baked crust and bake them together for just a little while. (It’s the same technique they use for their lemons bars, too.) It keeps the crust crispy and bakes for only 10-15 minutes! I thought the pie was fabulous. Sara gave it away to her friends and co-workers before I had a chance to get diabetes! I was so sad.